When is Easter? For me, Easter is many things more than just the normal history of Easter that we all know and have been taught in church and at home as we were growing up. We all have our own meaning of Easter; of Easter traditions and beliefs, have heard our share of Easter stories and tall tales, and have a refined list of Easter trivia and facts, special Easter sayings, and how to make unique Easter baskets and decor. But if I can sum it all up into two individual words, Easter for me is ‘unity’ and ‘family’. Easter games to print and play! Easter marked the end of the dreary foggy season, the beginning of sunshine and spring, a valley full of fresh blooms and bees, and some new clothes and shoes for me. I remember as a kid, I’d get a few dresses, a warm coat, and two pairs of shoes to start the school year. Work was plentiful for kids like me, and we didn’t have a choice. If you could use your hands and feet, you worked. We could pick peaches, berries, cut grapes, or pick cotton for enough money to buy new school clothes. When is Easter? Whenever it was, it was a special time. Family always pulled together and had the Easter blessing of unity from near and far. We congregated, we enjoyed one another and our big combined families came together to rejoice in life and the rebirth of the love we had for each other. Wherever my Grandmother was, that was the special ‘location’ for the reunion. You could hear the buzz months earlier, “When is Easter?” When is Easter Sunday? It was always a secret because if the kids knew what the plans were, we’d drive our parents crazy in anticipation of seeing our cousins and aunts and uncles! We were always the last to know. But I always thought I had an inside edge because I got a new dress and my first pair of beautiful sandals of the year for Easter. I particularly remember a beautiful Swiss Dotted dress that I got to wear to church for one Easter Sunday. I don’t know if you know what swiss dot fabric looks like, but it is a rather sheer fabric that has tiny dots of flocked-like raised bumps all over the fabric as part of the design. You Pick. You Personalize. You Print. Easter Games. While sitting in church I decided to “sample” the dots as “edible treasures” and before anyone had noticed, I had eaten many of the “dots” off my new dress and left only holes in their place. Imagine the horror my mother felt upon her discovery; but much worse was the surprise I got with a razor strap from my stepfather when I got home! I wasn’t too keen on the question, ‘When is Easter’ after that. Funny thing, too, I’ve never had the same urge or desire for anything that is made of Swiss Dot fabric since then. Not even a simple kitchen curtain! As expected, every Easter season I have a vivid picture of that dress and an even more exhilarating visualization of the razor strap that used to hang in the hallway on a nail just waiting for me to ”earn” a piece of it. ‘When is Easter’ lost some of its intrigue and mystery for me that day. When is Easter? We recognize the history of Easter as the celebration of spring and the celebration of life; which falls in line with the belief of the resurrection of Jesus Christ. Even if you didn’t go to church, you went on Easter Sunday. It held a special sermon by a Pastor who would promise many of the “sinners” that the ‘roof would not cave in’ if they came in and had a seat to listen and participate. The Easter hymns were beautiful, and I loved my Grandmothers singing. When is Easter? It was Easter hymns and Easter blessings alike. This was Easter tradition, and many came forward and dedicated their lives to Christ; the rebirth of Jesus and the rebirth for many sinners on this day. That’s what we believed and taught as kids. Someone in our family always stepped up and there was plenty of rejoicing in celebration of life and salvation. This was followed by a colorful parade of local characters and their wares of hard work and talent down the streets of our small town, great food prepared by everyone in a pot-luck ‘eat until your heart’s content’ fashion. First came the show. Then we enjoyed the feast. There was a special Easter egg for each and every person with their name on it. No one was ever forgotten. If you were family, regardless of how remotely related, you had an Easter egg with your name on it. And it was always made by someone special to you. That confirms when is Easter. And after the parade is when the fun really began. When is Easter? It is marked specifically by the Easter Egg Hunt. And an occasional softball game for those who dared. Usually there were two, one for the kids and one for the adults. But sometimes we mixed it up a bit. I always wondered who hid all those eggs. The Easter bunny? How did he know when is Easter Sunday? How did we ever get enough to color Easter eggs for everyone? And where did we learn all our special Easter egg decorating skills? When is Easter? I only knew as the oldest grandchild in my family of some 50+ grandkids (back then) and many more great-grandchildren, (and I’m so sure my Grandma’s absolute favorite), I set out to grab her hand first. Why? The lucky grandchild got to pair up with my grandmother with her big apron to gather Easter Eggs. Everyone had their tiny baskets to gather the eggs in, but my grandmother had a huge apron that she gathered the corners of to make a well as deep as Texas, and that lucky kid always had the most fun. Looking for top value for your entertainment Dollar this Easter? 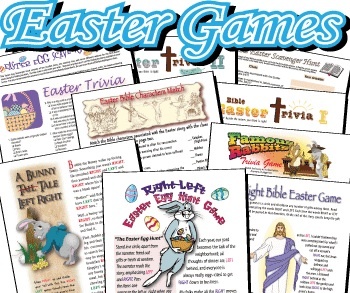 This Easter Printables: Easter Games bargain pack is a dream deal! I can still hear her giggles resonating in my ears, and her sweet face is so real I can almost reach out and give her a big kiss on her jolly cheek! No one ever enjoyed Easter as much as my Grandmother, any holiday for that matter. She would fill her apron full of colorful Easter Eggs, add a little candy from her ‘never-empty-pockets’, and many, many laughs along the way. She was the biggest kid of them all and I’m very sure no one ever enjoyed their families as much as she did, especially the grandchildren. We could do no wrong in her eyes. I always wondered how anyone could top our family count when we all got together; but I’ll bet her family in Heaven is at least three times the size. She had the biggest heart of anyone I had ever known. She had more love in her heart than ten people combined! And her love was completely unconditional, always. So, when you are asking yourself, “When is Easter?”, think back of your fondest memories of this holiday and linger there for a while in your special bliss. And if you are a caregiver, when you are shopping for your kids for things to fill their Easter baskets this year, think about how happy you could make a senior citizen who has no one. Make an extra Easter basket, or splurge on an Easter bonnet and make an elderly person smile for today. When Is Easter? Its upon us already. Find some humor. Seniors live it up! Share your Easter traditions with someone; spread your own Easter blessings to all those around you. Have a little fun, and for “goofy sake”, I Hope you have some spring in your hop this Easter season. Hop for joy! Spring is finally hare! (Copied from Kirk Strickland, Yahoo! Contributor Network) - - May the Easter bunny leave only tasty droppings in your Easter basket. Celebrate in fun, festive, and delicious ways. Games for a hoppin' good time! Return to the top of the page When Is Easter?